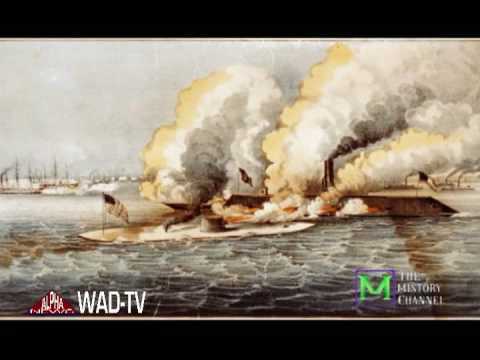 Naval history was made on March 8, 1862, when the first Confederate ironclad steamed down the Elizabeth River into Hampton Roads to attack the woodensided U.S. blockading fleet anchored there. Built on the hull of the U.S.S. 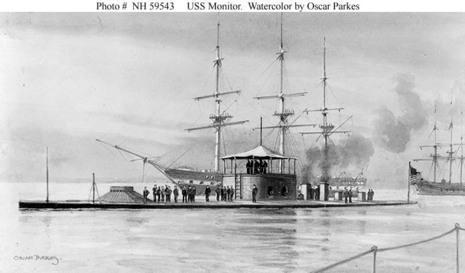 Merrimac (which had been scuttled and burned when the Federals abandoned the Gosport Navy Yard in April, 1861), the new warship had been christened C.S.S. Virginia, but in common usage retained its original name. After ramming and sinking the twenty-four-gun woodenhulled steam-sailing sloop Cumberland, the Merrimac headed for the fifty-gun frigate Congress. An awestruck Union officer watched the one-sided fight as the Merrimac fired "shot and shell into her with terrific effect, while the shot from the Congress glanced from her iron-plated sloping sides, without doing any apparent injury." 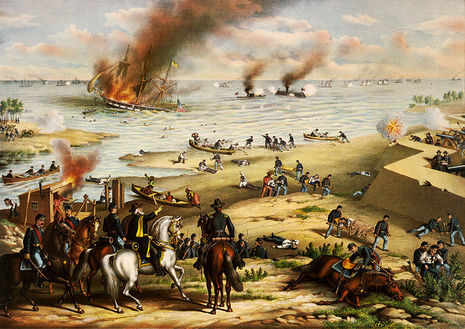 The Battle of Hampton Roads, often referred to as the Battle of Monitor and Merrimack (or Merrimac), was the most noted and arguably the most important naval battle of the American Civil War from the standpoint of the development of navies. 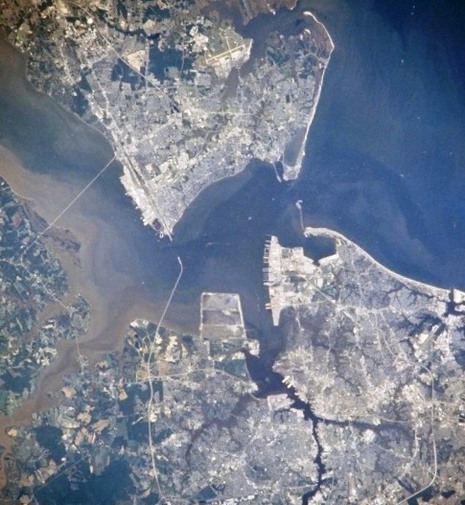 It was fought over two days, 8–9 March 1862, in Hampton Roads, a roadstead in Virginia where the Elizabeth and Nansemond Rivers meet the James River just before it enters Chesapeake Bay. 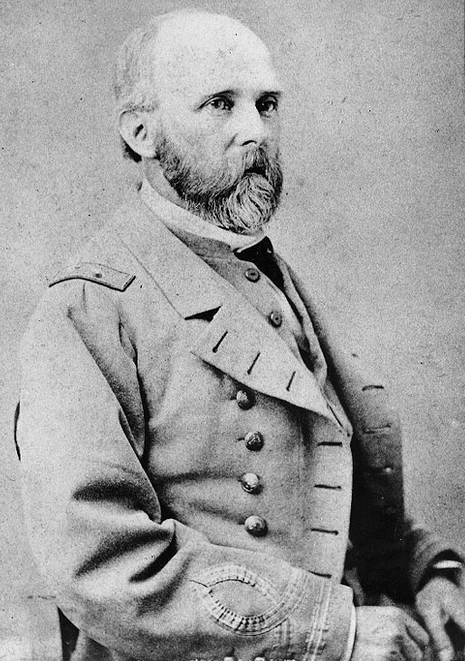 The battle was a part of the effort of the Confederacy to break the Union blockade, which had cut off Virginia's largest cities, Norfolk and Richmond, from international trade. 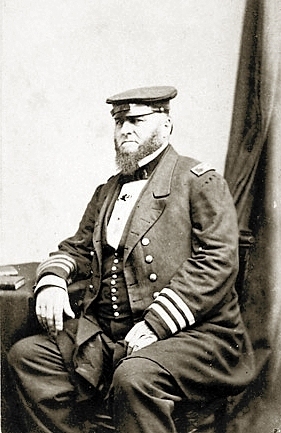 The major significance of the battle is that it was the first meeting in combat of ironclad warships. 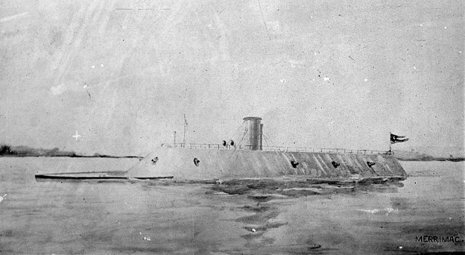 The Confederate fleet consisted of the ironclad ram CSS Virginia and several supporting vessels. On the first day of battle, they were opposed by several conventional, wooden-hulled ships of the Union Navy. On that day, Virginia was able to destroy two ships of the Federal flotilla and threaten a third, USS Minnesota, which had run aground. 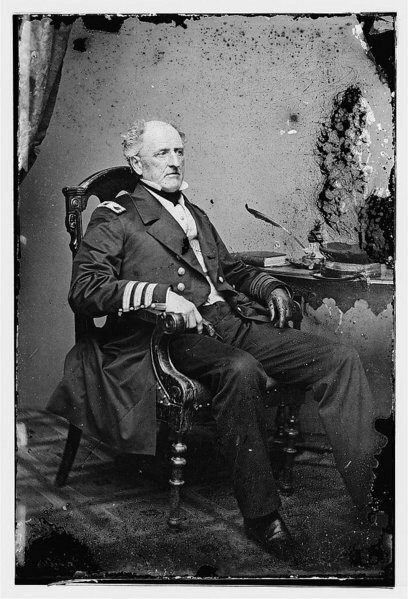 The action was halted by darkness and falling tide, so Virginia retired to take care of her few wounded — which included her captain, Flag Officer Franklin Buchanan — and repair her minimal battle damage. Determined to complete the destruction of Minnesota, Catesby ap Roger Jones, acting as captain in Buchanan's absence, returned the ship to the fray the next morning, 9 March. 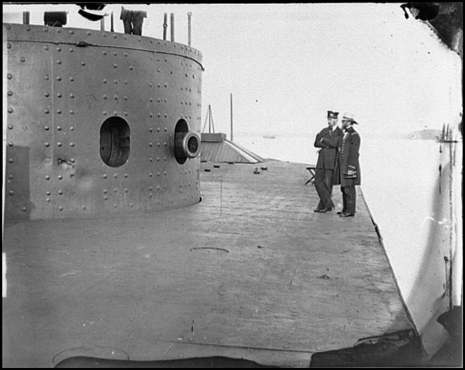 During the night, however, the ironclad USS Monitor had arrived and had taken a position to defend Minnesota. When Virginia approached, Monitor intercepted her. 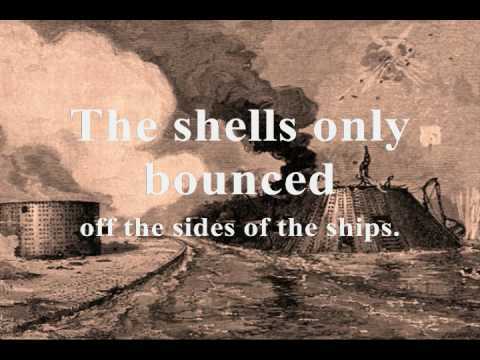 The two ironclads fought for about three hours, with neither being able to inflict significant damage on the other. The duel ended indecisively, Virginia returning to her home at the Gosport Navy Yard for repairs and strengthening, and Monitor to her station defending Minnesota. The ships did not fight again, and the blockade remained in place. The battle received worldwide attention, and it had immediate effects on all navies. The preeminent naval powers, Great Britain and France, halted further construction of wooden-hulled ships, and they were copied by all others. They produced a new type of warship, the monitor, based on the principle of the original. The use of a small number of very heavy guns, mounted so that they could fire in all directions, first demonstrated by Monitor, soon became standard in warships of all types. Shipbuilders also incorporated rams into the designs of warship hulls for the rest of the century.